Moving can be stressful. This is true whether you are a human, a horse, or any other type of animal. As with people, horses have different temperaments and personalities. Some horses will adjust easily to a new home while others require more time and patience. Luckily, moving to a new home in Ocala means you’re in good equestrian company. Known as the Horse Capital of the World™, Ocala and surrounding communities in central Florida are full of horse lovers and the businesses and services that support an equestrian lifestyle. Picking out a new home is usually a fun process, but moving your horse will be more challenging. Keep in mind that both the travel and the new surroundings can take a toll on your horse. This stress can weaken your horse’s immune system, so you’ll want to take steps to avoid illnesses as well as being on the alert for signs of a respiratory infection or other problem. When in doubt, call the vet! Here are the most important things you can do to help your horse adjust to his new home in Ocala. You checked the fences, gates, doors, and grounds before buying your new equestrian property. Now it’s time to make sure the entire property is hazard-free before you move your horse there. You can do a pasture check to ensure there are no problem plants including ragwort, deadly nightshades, acorns, and buttercups. This step is especially important if you’re moving from another area where winter routinely freezes out problem plants; they can grow year round here in Florida. The UF/IAFS has a thorough discussion of problem plants. Click here to read Dangerous Plants to Horses in Paddocks and Small pastures. After safety is established, tend to the basic needs your horse will need upon arrival: set up the stall, bedding, hay, and water ahead of time. As we’ll discuss below, it’s helpful to bring some of the bedding, hay, water, and feed your horse is already used to from his previous home. Overall, keep it simple. You want the environment to feel as familiar—and as calm—as possible. When it comes to settling in, let your horse establish the pace he feels comfortable with. You may want to buy some new toys or treats to sweeten the experience. Also keep in mind that horses are social animals, happiest in herds. Remember, your horse isn’t just adjusting to a chance of scenery. He may also have left behind familiar herd mates. While it’s good to isolate your horse for the first few weeks to avoid spreading disease, make sure he can at least see other horses and animals. This will help him feel like he’s part of a group. How do you help a horse adapt to a new routine? The best answer to this question is not to introduce a new routine at all but keep your horse’s routine as close as possible to what he had before. During the “ease-in” process, introduce any changes in the feeding and turnout schedule gradually. Try to avoid stressful events such as worming, vaccination, shoeing, dental treatment, and introductions to new horses in the first few days after arrival. To start, leave your horse in his stall for a few hours after he first arrives. This gives him time to adjust to the new sensory stimulation (sights, sounds, and smells) before you take him for a quiet walk around the property. During that walk, you’ll want the environment to be quiet and slow-paced. No loud mowers or blowers, no bedding trucks coming in and out, just an environment as calm and subdued as possible. This is another adjustment that varies by horse. Some horses don’t mind a change in climate, so moving to sunny Florida won’t negatively impact their health or behavior. For others, the change in temperature and humidity can come as a real shock their systems, and they will require an acclimation period before they are used to the new environment. You can help your horse through this acclimation process by ensuring that he has plenty of fresh water which will help his natural ability to produce sweat. Pay attention to your horse’s behavior, watch for excessive sweating, use box fans in the barn as needed, and make sure he’s getting enough water to avoid dehydration. How soon can you ride your horse after the move? 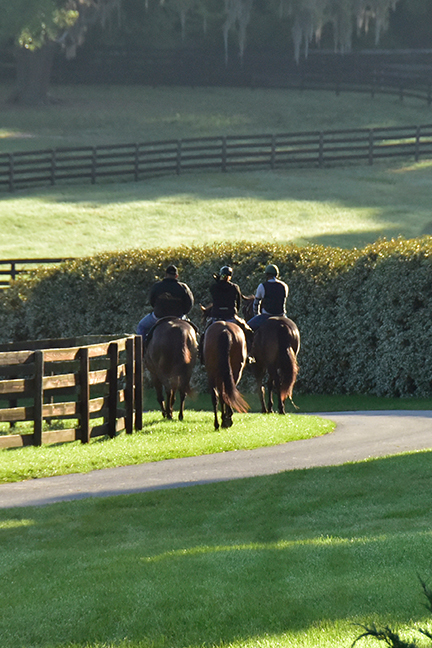 For many people, purchasing a horse farm is a dream come true. It’s natural that your first impulse is to take your horse out on a nearby trail or for a lap around your track. However, let him settle in for a few days before you attempt a ride. Start with a bit of round pen exercise to let the jitters out. If you don’t have that option, try a few minutes of turnout before you ride. Let your horse exhaust any nervous energy before you get into the saddle. Once you start riding, keep it simple and familiar until your horse seems comfortable in his new environment. How do you acclimate a horse to new feed and water? As we mentioned above, it’s best to keep your horse on the same diet at first. Abrupt changes in forage and feed put your horse at risk for colic and other gastrointestinal issues. Keeping the water the same can be trickier. Some equestrian experts recommend adding a little sugar or Gatorade (which has high sugar content in addition to electrolytes) to your horse’s water before and after the move. That way he won’t notice a change in water taste. One your horse has settled down, you can phase out the flavor. Introduce new forage and hard feed on a gradual basis, and keep your horse’s water and food containers separate from other animals to prevent disease. Consider how your own behavior may change in situations that are new or stressful. It’s perfectly natural for your horse to undergo a temporary change in behavior after a move. He may scream and peer into other stalls, looking for herd mates they left behind. As long as your horse is eating and drinking well, and isn’t losing weight or developing a bad habit, changes in behavior are not cause for concern. Spend as much quality time with your horse as you can. Your presence is one of the only familiar things in his new life, so staying close will help him feel secure. The primary health concerns for horses after a move are dehydration, colic, and respiratory disease. Keep a close eye on your horse for the first week, taking his rectal temperature morning and night to make sure it doesn’t stay higher than 101 degrees. Make sure your horse is drinking enough water and consider starting a live yeast probiotic to help with stomach issues. At the first sign of illness, call the vet. It’s a good idea to choose a vet and establish a relationship before you move. Looking for an equestrian property in Ocala? Here at Showcase Properties, our love of horses is part of our real estate business. If you’re looking to buy a horse farm in Ocala, we can connect you with one of our locally experienced agents. The experienced team of professionals at Showcase Properties wish you the best of luck in getting your horse (and your family) acclimated to your new home. 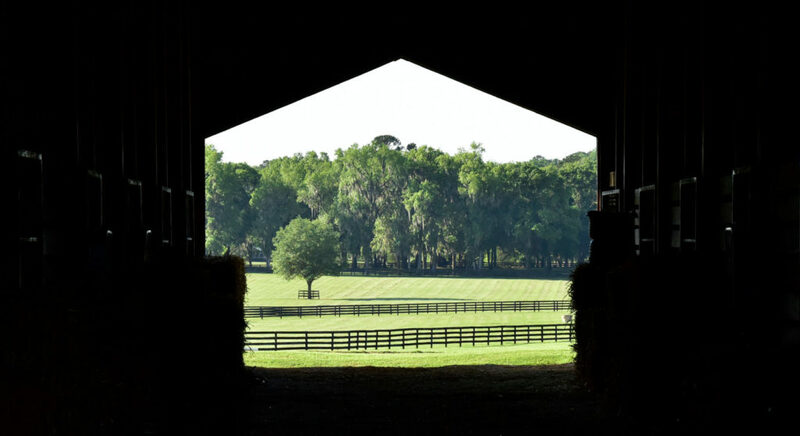 Whether you’re looking for a hobby farm, a training facility with a track, a luxury estate, or another type of property in Ocala, we’re here to help. Please contact us if we can help you find a new home in Ocala or answer any questions you have about getting settled. Welcome to the Horse Capital of the World™!